LCHF Quarterly Digital Magazine ‘LOSE IT!’ 2nd volume has just been released. More inspirational stories, information, and best of all numerous new recipes! And since it’s digital anyone globally can buy it. YAH!!! This entry was posted in lchf, LCHF recipes, Personal journey and tagged Atkins, banting, inspirational stories, LCHF, LCHF magazine, lchf recipes, lose it, LOSE IT! 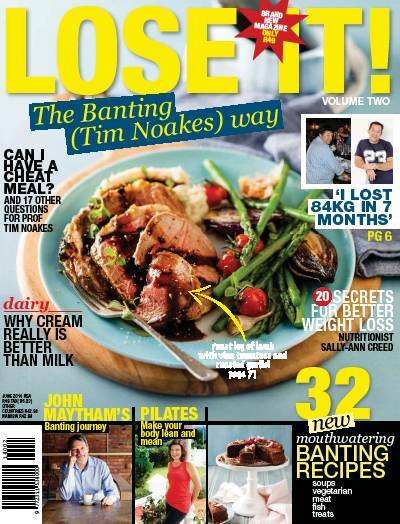 magazine, tim noakes by angelb38. Bookmark the permalink. Where can I get hold of magazine issue 2? I am trying to get hold of volume 2- Lose it! magazine! Cannot open or find it on digital where can I purchase it? Evening! It appears that zinio & mysubs are not digitally selling this copy any more, which is just crazy, since being digital, it’s great to be able to get back copies. Let me see if I have a PDF version I can share with you, esp the recipe section! Sent. Let me know if you don’t receive it. Hello I ordered 2 copies of Vol 2 and sent proof of payment over 3 weeks ago? Please can you follow up with this? Address 4 Byways 9 Crescent Road Claremont 7008. Evening Dianne. Nothing worse when you are not receiving the copies you’ve purchased! Unfortunately, I am not involved nor do I have any affiliation or contacts to the various media groups that are publishing and/or selling this magazine. My blog is in essence my experience & information I find useful, which I share & hope others find useful as well on their own individual journeys. That being said, if you ordered physical copies, then you might not be receiving it due to the postal strike…which seems never ending. If you ordered digital, you should be able to download immediately, if you have the app on your computer. If not, download the applicable app you require…the website should advise which app they use. My suggestion is you either contact them via their customer care section, or via their contact details provided on their website to find out what the delay is, and how they are resolving it for you! Best of luck & I hope you get your copies sooner, rather than later. Evening! So strange you didn’t receive my email. Could it be in your spam? I’m unable to send the pdf’s this week, since I am not at home, but will do so again next week for you. Dianne, please note, I’ve resent the email to you this morning! I am also finding it difficult to find Volume 2. I would be grateful if I could purchase a copy from you. Morning Vic. Apologies for the late response, but I’ve been neglecting my blog for a few weeks, but now I’m back on track. I mentioned earlier in the comment section of the blog, that it appears this volume is no longer being sold via digital, even though this doesn’t make sense to me! What I have tried to do, is email you my pdf version, this morning! Evening, the email was sent this morning to karibag@gmail.com, and the PDF attached was 11,8MB. My email shows it going through/being sent. The email address karibag@gmail.com is correct and it can accept files this size. I would really appreciate it if you could try and send it again? Morning, it’s been resent by two different email accounts to you this morning. If you don’t receive it, then I suspect you have a firewall in your system that is preventing it from being delivered. Angela I am struggling to get volume 2. Would appreciate if you could PLEASE email a copy. Faye, I am not affiliated to this publication, so I am not able to provide you a copy of this magazine, since it’s copyright protected. go to http://www.zinio.com, where you can buy a digital copy of the 2nd issue for R49. Hope this is of assistance!